ProModel has been successfully helping to improve manufacturing for over 25 years, so it is no stretch that we can carry that same success into the field of healthcare and have already been doing so with our MedModel technology for several years. If you would like more information about how ProModel can help you make critical decisions about your Healthcare Organization contact us @ 877.333.4499 or HealthcareSolutions@ProModel.com. 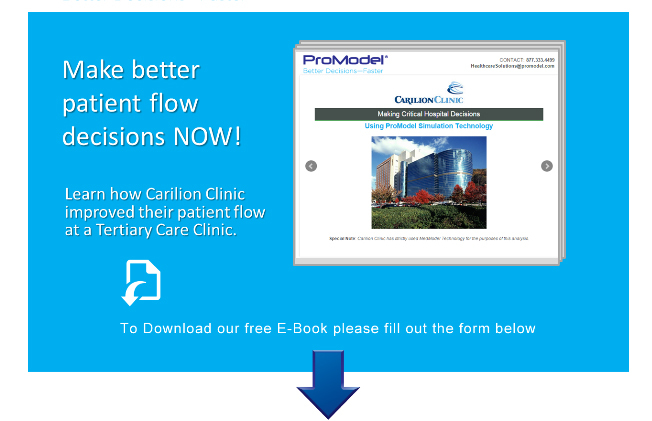 Also checkout http://www.promodel.com/Solutions/HospitalPatientFlow and http://patientflowstudio.com. This entry was posted in Healthcare and tagged Hospital Process Improvement, Patient Flow, Predictive Analytics, simulation solutions. Bookmark the permalink. ← ProModel Salutes Founder Charley Harrell for Years of Service…and Getting This Whole Thing Started!